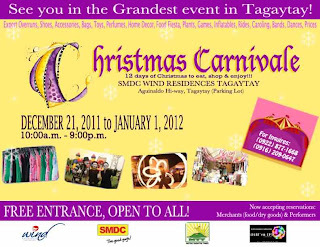 Enjoy Tagaytay's cool breeze with some shopping on the side! Check out Christmas Carnivale Bazaar from 10am to 9pm on Dec. 21, 2012 to Jan. 1, 2012 at SMDC Wind Residences parking lot, Aguinaldo Highway, Tagaytay. Entrance is free!